An insurance policy is a legal contract between the insurance company (the insurer) and the person(s), business, or entity being insured (the insured). Reading your policy helps you verify that the policy meets your needs and that you understand your and the insurance company’s responsibilities if a loss occurs. Many insureds purchase a policywithout understanding what is covered, the exclusions that take away coverage, and theconditions that must be met in order for coverage to apply when a loss occurs. An insurance policy is a contract in which an individual or entity obtains a financial protection or security against the losses, which may happen at any undesirable instant of time. These are those policies which helps an individual to have an assurance at one side by paying a specific amount of payment in exchange to an entity. Life Insurance: This insurance provides a monetary benefit to a decedent's family or other designated beneficiary, and may specifically provide for income to an insured person's family, burial, funeral and other final expenses. Property Insurance: As the name suggests, the property insurance provides protection against the risks to property such as the fire, theft or weather damage. Health Insurance: These insurance policies cover the cost of medical treatments. 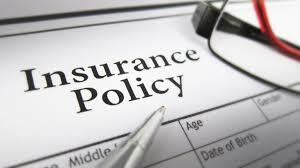 Often, these are the most common type of insurance policies among the employees. Personal Accident Insurance: These insurance allows a full compensation to the individual suffering from a danger injuries, accidents or loss of life. The policy also includes the compensation cost of the treatments, along with the use of hospital facilities at the time of treatments. Accident, Sickness, and Unemployment Insurance: These insurance if for the disable one’s or for the one’s who have faced accidents with a major body part loss. Travel Insurance: The policy covers the insured against the various misfortunes which happen during the traveling. The travel insurance covers the insured loss regarding the medical losses, traveling accidents, luggage and baggage losses, etc. Liability Insurance: This type of insurance is a broad superset, which covers the legal claims against the insured. Liability policies typically cover only the negligence of the insured, and will not apply to results of willful or intentional acts by the insured. Motor Insurance: The motors or vehicles running on roads have to be insured, so that at the time of any accidents or problem these motors can get their penny back from the claimed insurance. Credit Insurance: This insurance repays some or all of a loan when certain circumstances arise to the borrower such as unemployment, disability, or death.